A dental bridge fills in the gap left behind by a missing tooth. Like crowns, they rest over the top of stable teeth on either side of the space, suspending an artificial tooth between them. While most bridges are used to replace one or two teeth in lieu of wearing a removable partial denture, they can also be placed on top of pairs of dental implants for multi-tooth replacement. Your new restoration will be made from a high-quality porcelain or ceramic material that blends naturally with the smile around it. Because we know both durability and aesthetics are a concern, we use all of the resources available to us to ensure the best possible outcome. Before getting a bridge, we’ll need to make sure the teeth adjacent to it are healthy enough to support a fixed prosthesis. If they are, we prep them so that the bridge will fit over each one and then take a digital scan that is sent to our lab. About two weeks later, the permanent bridge is ready to install. 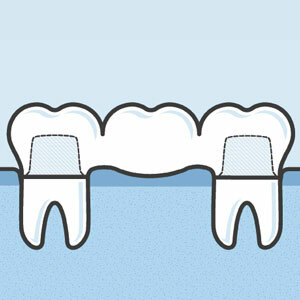 Implant supported bridges may take more time to complete, as additional implant surgery is necessary. Thanks to digital scanning, you can avoid the need to have a gooey impression made of your mouth. The virtual data is more accurate and comfortable, improving the speed at which a high-quality restoration can be crafted by our partnering labs. Although a bridge is not natural tooth structure, it’s important to clean around yours daily to keep the supporting teeth stable. Otherwise, decay or gum disease can cause the tooth — and restoration — to weaken and fail. In addition to brushing around the margins of your bridge, it’s important to clean underneath with a floss threader or a tufted brush. Contact us today for more information on getting a dental bridge.